Today you are going to know how to do the chest workout that is going to help enhance and lift your breasts naturally. What do you want to do is you want to think about how chest muscles are structured. You have three different muscles: you have the lower muscle, you have the mid muscle, and then you have the upper muscle. As far as I’m concerned, you do not even have to work your upper chest muscles at all. You want to focus on the lower muscle as well as the mid. Because that is what is going to help enhance your breasts and lift them. The stronger you are under your breasts, the higher your breasts will be. And that will make you feel good about yourself. You should start out of decline chest press. You should do three sets, about 10 to 12 reps and then you should rest for 30 seconds in between each set. Grab a weight that you are comfortable with and let’s do this. You should sit down on the bench and make sure that your arms are parallel to the floor, not beyond parallel or about parallel, but strictly parallel. And just come on to the top. Nice and easy. And you want to inhale on your way down and exhale on your way up. Also, make sure that your arms are not completely straight because that puts too much pressure on the elbow. Two seconds down. Two seconds up. You should use a weight that allows you to feel like you are doing something. Be mindful of how you do this exercise and lifting your body in a way that makes it functional. After this exercise, you want to stretch out. Open up your chest and hang your arms. 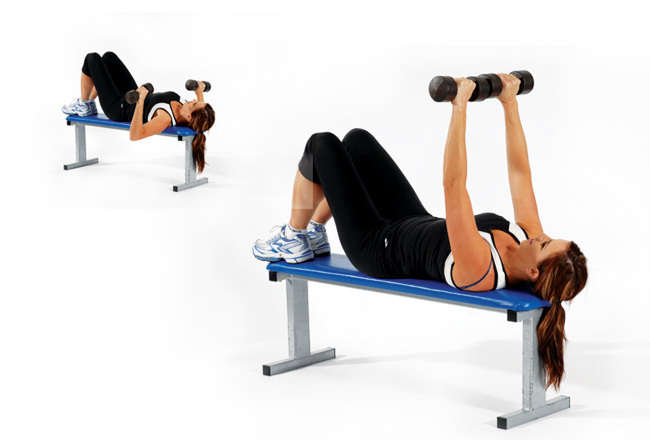 The next exercise is a flat dumbbell press. What you are going to do is flatten your bench and just lay on it, bend your knees. Grab weights. And do the same exercise again. Do about 10-15 reps.
Third and final exercise. You should do about 10-15 reps, three sets. You should rest 30 seconds in between each set. A seat at the edge of your bench. Make sure that your hands are about shoulder-width apart. Grab the bench. And depending on how strong you are, you want to make sure your feet are either out to make it more challenging, or if you need a little breather at this point, you bring your feet in. Make sure that your chin is parallel to the ground. So literally move down and up.